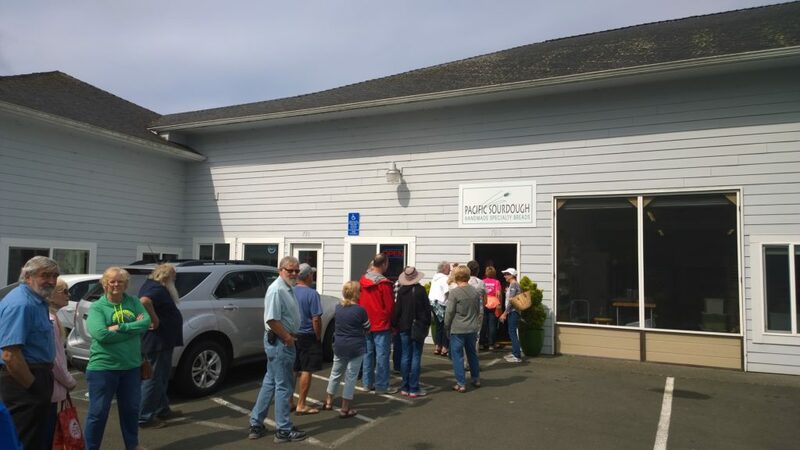 If you’re in Waldport on a Thursday or a Saturday morning, you really need to stop at Pacific Sourdough. 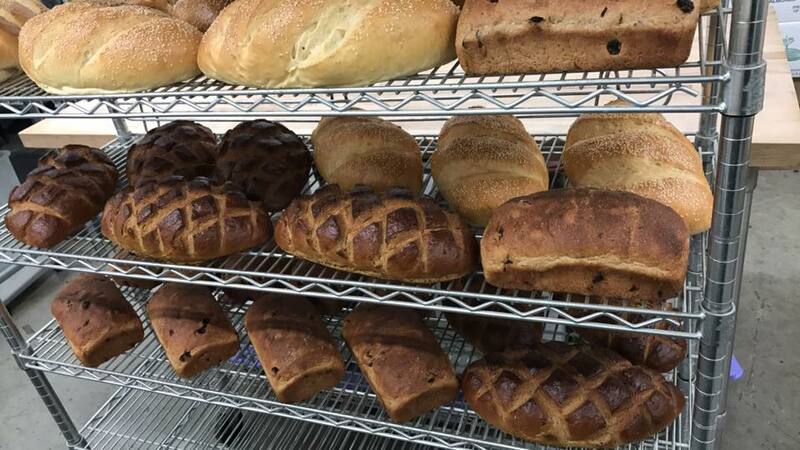 This specialty bakery is open ONLY on Thursdays and Saturdays from 10-3, and it’s so popular that it’s a good idea to get there early in the day, especially during the summer. We stopped in a few weeks ago around 10:30 in the morning and the line was already out the door to the road. Once inside, we decided that it had been worth the wait. But, what to pick?? That beautiful criss-cross loaf? It’s a fabulous rye bread that we enjoyed a different time we were here. But this time was opted for a big round sourdough loaf and it did not disappoint–though it was hard to cut, it was perfect chewy deliciousness. We couldn’t resist a few little loaves of pretzel bread. The loaves look either like a huge pretzel or a small baguette and were a perfect thing to nibble at (no knife needed) in the car on the way home. They were deeply brown, and were chewy salty deliciousness. I also bought a loaf of potato bread which I found to be rather underwhelming, especially compared to the wonderful sourdough loaf. However, all was not lost—it made excellent french toast a few days later. Once we’d chosen our bread, we could not get out of the store without falling for some of their single-serving size goodies. I had a spinach and feta bread that was heavenly. We also happily ate some cheese and green onion scones. They are deliciously, richly crumbly and we will undoubtedly order them again. Then there were the sweet goodies. I was sorely tempted by their several chocolate offerings but resisted. John greatly enjoyed a rather large blueberry apricot plum cake, as did one of the other kids. 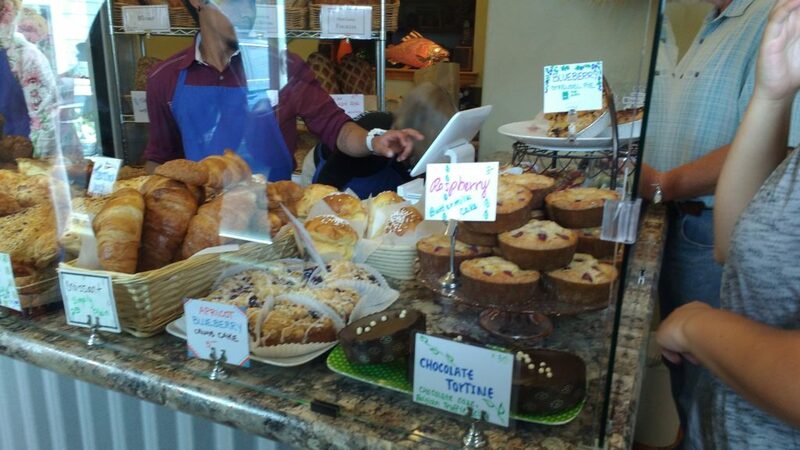 The cherry turnovers were also a hit, and will be bought by us again! And one thing I want to try next time– I had to quit buying someplace!– are their lemon ginger scones. I hear they are wonderful. Rumor has it that when the business moves to a large facility later this fall, it will be open on Fridays as well, but for now Thursdays and Saturdays are it. To get to Pacific Sourdough, head inland at the stop light. Go past Ray’s Grocery, and turn left onto Mill Street. The bakery is on the left side, in the same building as the carpet store. 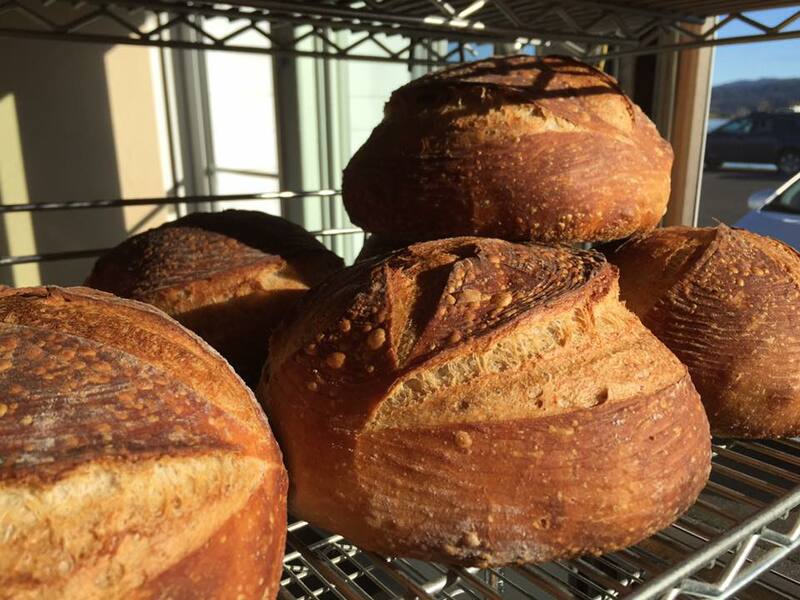 For more tempting photos and recommendations from others, visit the Pacific Sourdough Facebook page. Thinking of planning an Owlhaven vacation next year? Reserve your dates soon because June and July are getting full. We still have a week or two available next month though. So check your dates and round up your clan for a weekend getaway! We’d love to have you visit.